In cleaning out that old cabinet, I also found this radio. 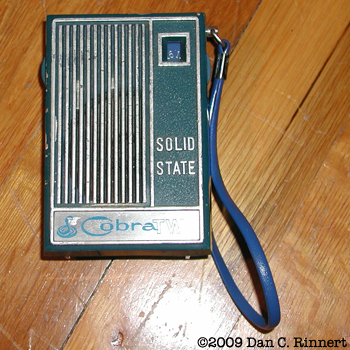 This is the first portable radio that I remember having. Ran on a 9V battery, so you know it’s old since it seems like most later electronics always seemed to require two AA batteries. I can remember sitting in the back of the van when I was a kid, one night on our way back home from somewhere, and listening to “Funkytown” by Lipps, Inc. That’s my longest lasting memory (and perhaps earliest?) of this radio. Great, now I’m going to have “Funkytown” stuck in my head all day. Cool radio tho. Does it still work? My first transistor radio was a Donald Duck Radio and my sister had the Mickey Mouse one. Living in CT. in and amongst the mountains and trees we didn’t get much on them but they sure were fun to carry around. Why are you all trying to kill me? I think Dan and Hollydale like Vintage stuff because of an enzyme in cheese. I sooooo remember these types radios. I think I had the same exact one, except mine was red. No… wait… I’m not that old. Vintage radio. Woah. I recollect getting one mighty similar as a prize when I was a wee lad. Thought I was da boss fo sho’.